AUGUSTA — Ann Lee Hussey doesn’t want children born today to have the same childhood memories she has — multiple surgeries, cold hospital rooms, taunting by peers and Easter egg hunts in a wheelchair. So the polio survivor has dedicated much of her life to working to help eradicate the disease that struck her as a little girl. She told her story to a few dozen attendees at a presentation Thursday at the University of Maine at Augusta, organized by the Winthrop Area Rotary Club. As a slide show played behind her, showing polio-stricken children in poor countries, some dragging themselves through dirty city streets, struggling to survive, she told those gathered that it was the story of those children, not hers, that she really wants people to remember. The worldwide fight to eradicate polio, in which Hussey said Rotary has been a leader through the Polio Plus program, is a hard, under-funded fight but is so close to being successful, Hussey said. But she warned the last 1 percent of the fight will be the hardest, and urged people to give to help the fight. Hussey has taken action to fight the disease directly, even though she has had physical obstacles to overcome because of her polio, including misshapen feet, damaged muscles and limited range of motion in both her ankles. She has participated in 20 Rotary National Immunization volunteer teams, traveling to India, Egypt, Mali, Niger, Nigeria, Bangladesh and Chad to help immunize children against polio. On one of those trips earlier this year, during 14 days in India, she met Lefty McIntyre, a member of the Winthrop Area Rotary Club. Craig Hickman, president of the club, said McIntyre suggested Hussey speak in central Maine. “I think of Ann Lee Hussey as the Mother Theresa of polio,” said McIntyre. Polio is caused by a virus and can cause lifelong paralysis or even death, according to the Centers for Disease Control and Prevention. The disease can spread easily. The polio vaccine can protect against the virus. Before the polio vaccine, there were more than 20,000 cases of polio in the U.S. each year. Today, there are none, and none have originated in this country in 20 years, according to the CDC. Hussey said the oral vaccine used on the immunization trips is easily given and also contains vaccine for other diseases, including measles. Hussey criticized American parents who refuse to vaccinate their children. Hussey, a member of the Casco Bay Rotary Club in the Portland area, is a veterinary technician who, with her husband, Michael Nazemetz, owns Village Veterinary Clinic in Rollinsford, N.H. 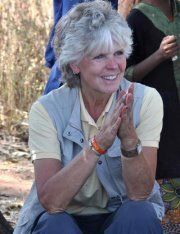 In 2005 Hussey received the Rotary’s highest honor for individuals, the Service Above Self Award and in 2006 she received the Rotary Foundation International Service Award for a Polio Free World.